I’m a blue and white girl through and through. I love the crisp and classic-ness of it and to be honest, our entire house is slowly turning into all blue and white everything, and I don’t hate it one bit! I’ve always loved the color blue. 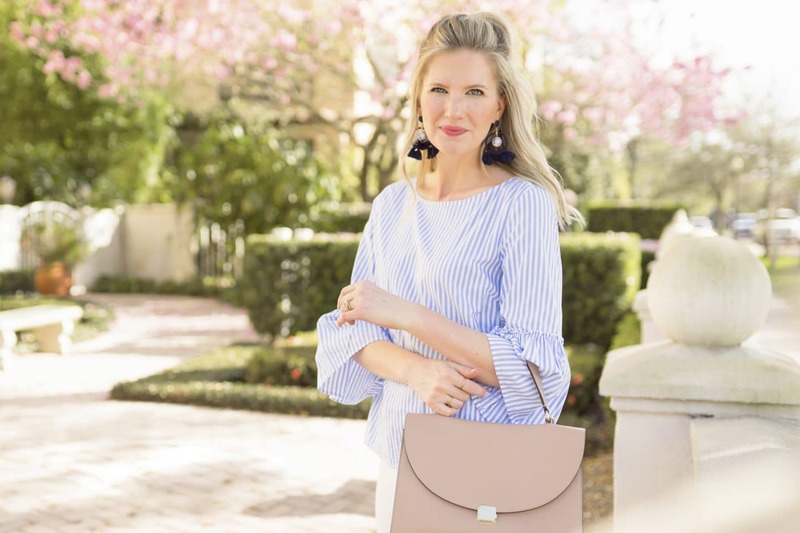 It has been my favorite color since as far back as I can remember… Even to this day, when I get dressed in the morning I often find myself reaching for the blues! I feel the most confident and like myself in cornflower blue. 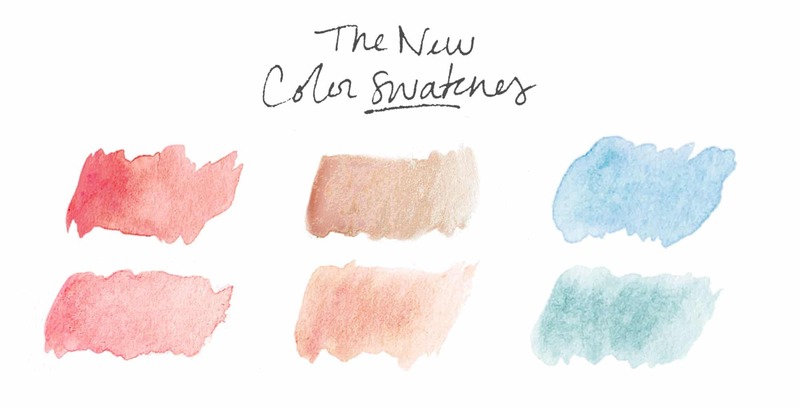 Do you have a color combo makes you feel the most “yourself” when you’re wearing it? I find it funny that most of us do! Also as a total side note, Ryan feels the same way about blue, which is hilarious and often means we are we’re in matching outfits. But whatever, as long as we feel good… that’s all that matters! Win These Blue & White Chinoiserie Earrings! Speaking of blue and white! 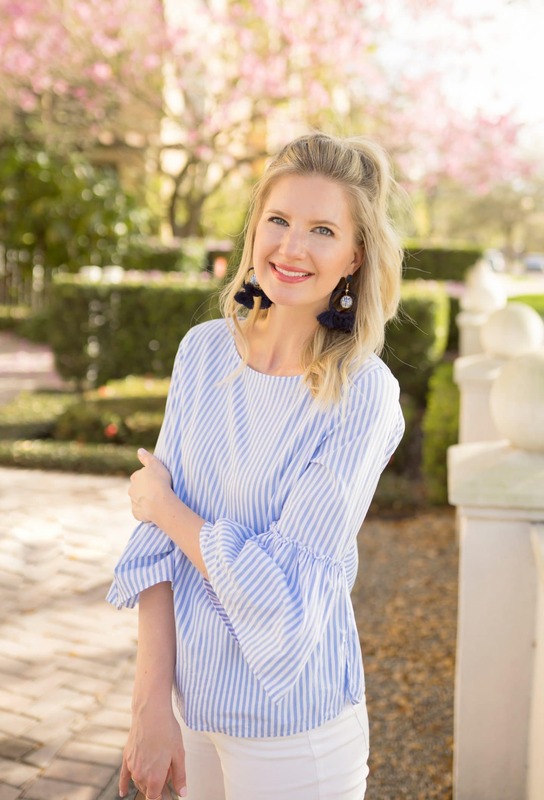 A couple of months ago when Kristen from St. Armands Designs reached out to tell me about her blue and white statement earrings I instantly fell in love love with them! 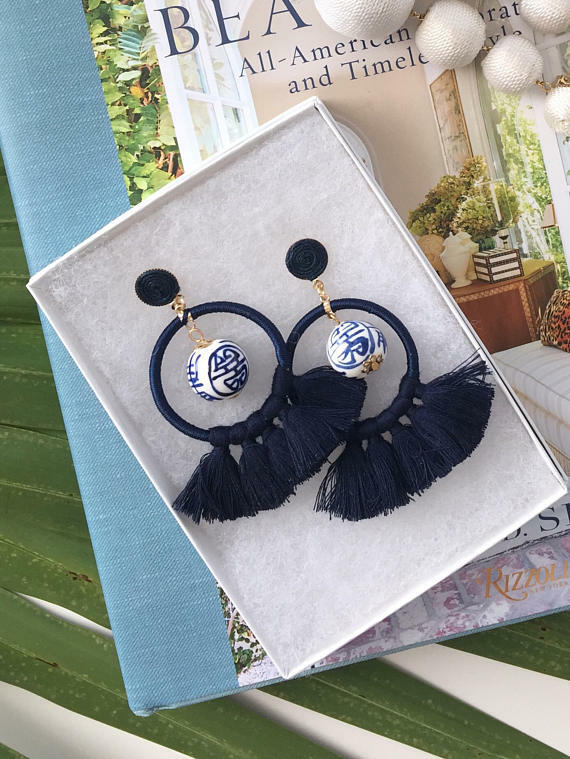 Not only were they incredibly cute with their navy tassels and Ginger Jar motif, but they are also seriously affordable! 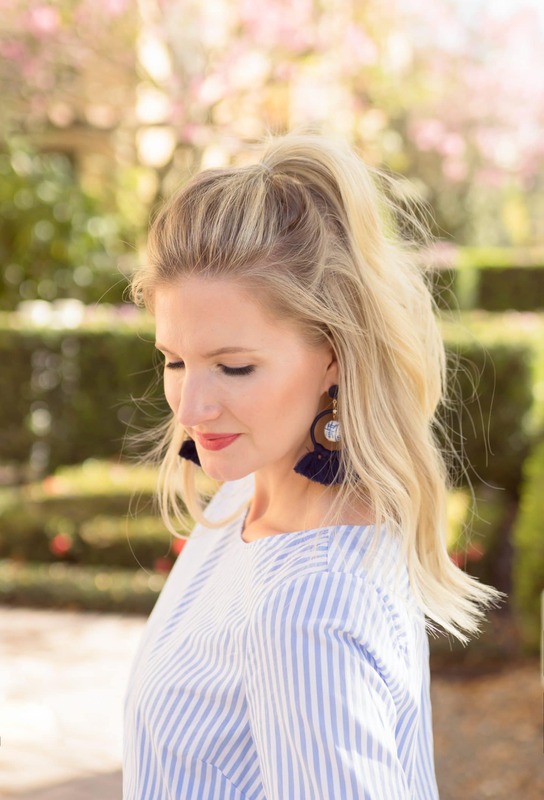 After chatting back in forth over e-mail we thought it would be fun to give away a pair of these earrings for those of you here on the blog and over on our Instagram page! They are honestly the most fun thing I can think of to give away! Like and tag your BFF on my Instagram post tonight talking about these earrings! And for a BONUS entry, comment below with your favorite blue & white thing you own! It can be a sweater, vase, pillow…the options are endless!! I’ll be keeping my fingers crossed for you! *Giveaway ends Friday, March 2, 2018 and is open to US residents only. The winner will be announced that weekend. The Statement Earrings You’ll Never Take Off! I have a blue and white porcelain vase from my grandmother that I’ll forever cherish. My favorite blue in my item is definitely my grandmothers vase she passed down to me! My favorite Blue and White item is my new living room rug! It’s the basis for the room’s overhaul. I actually don’t have a favorite blue AND white thing but will try out the color combo. Those earrings are gorgeous. My favorite blue and white item is an antique dinnerware set my grandmother had. 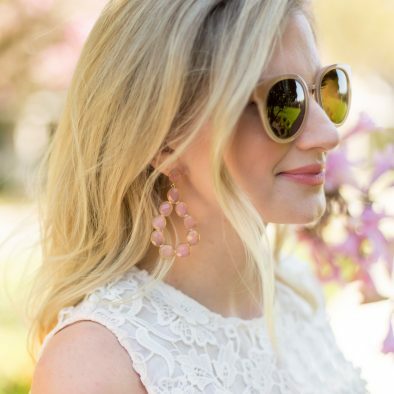 Absolutely in love with these earrings, Ashley!! My favorite blue and white items have to be the Blue Willow dish set that my grandma passed down to me. 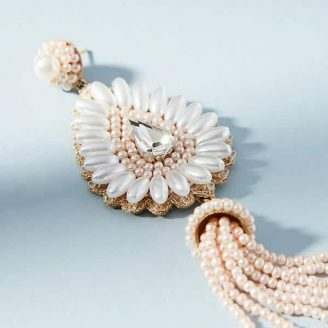 So classic and elegant! My new ginger jars!! They are a timeless classic that I am happy have become a recent “trend” in home decor. My favorite blue and white item is/was my blue and white striped shorts that I worn when I was pregnant. ❤️I wore for all three pregnancies and loved them! Those earrings would have looked great with them. I’m on the hunt now for some blue and white shorts now that I’m back to my normal size! Lol Love your top too! I have a blue and white striped top with bell sleeves. I love it because you can dress it up or down. I collect blue and white vases that I display in our built in shelves. I’d have to say that my favorite is one that was given to me by my mother. My favorite thing that is blue and white is actually this big area rug in my living room I found on Wayfair! Blue is my go to! Love blue and white stripe tops! Especially this one you’re wearing! One of my favorite things I own is a Barbara Cobb hat that is navy and white. Cute. Cute. Cute. My blue & white everyday china from Kate Spade! My little blue and white trinket bowl is my favorite to put jewelry in!